Awesome project! I love, love, LOVE that star!!! This is so clever! I love the way you always come up with he perfect tie-in to the recipe using some fun character! 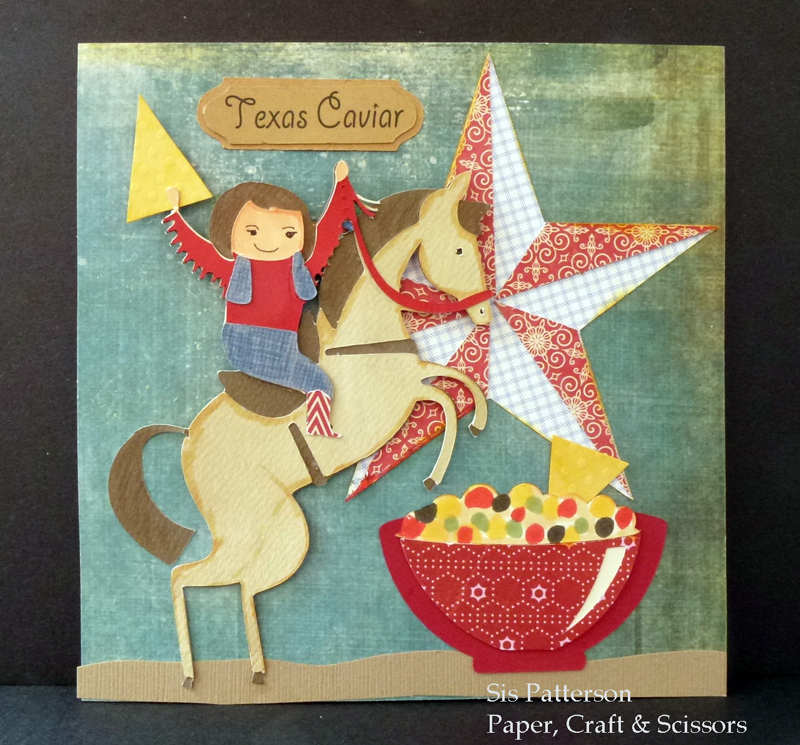 The cowgirl with the giant chip, the Texas Star, both to illustrate the dish, are just too much fun! And then to have to also tie in a holiday?? Holy cow! You picked the perfect palette, and again, the star is perfect to do that! I won’t even mention that you made a paper version of TX Caviar!! Fun as always!! Well Nadia stole my eloquent words, so I’m going with ditto to Nadia. 😉 Seriously, cute, my friend….as always. I always love what you do with these….tiny masterpieces that make my day! Gorgeous!! And I love the chip being waved lol. Recipe? Once again you have out done yourself. Your creativity is superb. Thanks for always sharing. This is awesome! I love how you used both of your machines to make this fun recipie card. Love the perfect paper choices and the details you added with the Copics!!! I so need to learn to do that. Another wonderful recipe card!! Very cute! I love all the paper you chose, especially the tortilla chip!